Hardie board siding has shaken up the home construction game by introducing a durable and long lasting material option for finishing the exterior of a home. 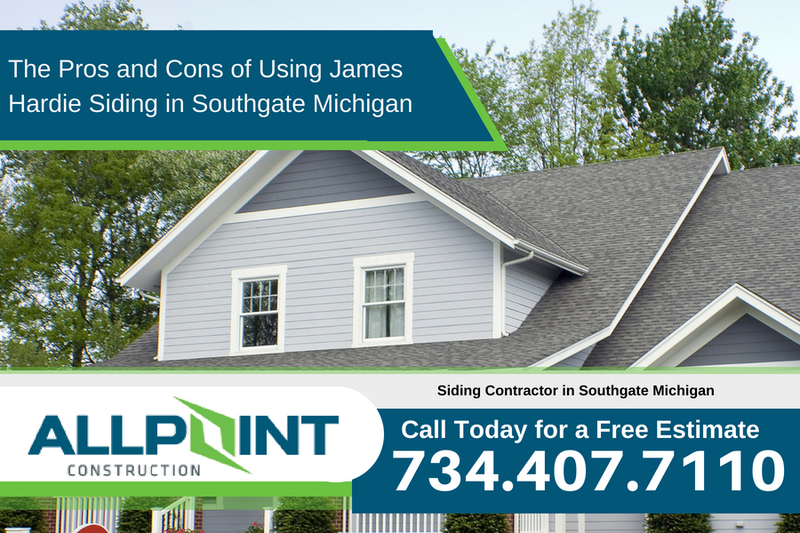 When choosing whether or not to consider using James Hardie siding in Southgate Michigan, you must weigh the pros and cons to the material and take into consideration what they could mean for your project. As always, it is best to consult with a professional siding contractor in Southgate Michigan such as All Point Construction to discuss your options and whether James Hardie siding will be your best choice. One of the components that can really make an impact on the way your home looks is the siding that is installed. Having older, worn out siding can make your home look old and decrepit. But with newer, more modern siding such as James Hardie siding installed on your home you can boost the value of your home, it’s energy efficiency, and more. I’ve listed the advantages and disadvantages most commonly found with James Hardie siding. With James Hardie siding, you will get a long lasting exterior to your home that will last a lifetime. Often, the Hardie siding manufacturers will offer up to a 50 year warranty. Not only does it last, but the James Hardie siding is durable and can withstand being put through the wringer. James Hardie siding is insect proof, weatherproof, and ocean proof. The material is also rot resistant, adding to its long life. In addition to a long life, the James Hardie siding offers great diversity with design choices. The siding can be made to look like almost any other material. Wood grain, cedar planking, shingles, shiplap, and more are just some of the options that Hardie board can be made to look like. Adding to this, the material can be made in a multitude of colors, providing the options of truly custom and unique looks. Often the finishes alone will come with a long warranty, so be sure to consult with your contractor to be sure you are using a covered material. Hardie board is also fire resistant. As if there was anything else it needed to resist, a Hardie siding exterior is far less likely to catch fire. Because the material is made from 90% sand and cement, it is virtually indestructible. The material can also withstand harsh weather and storm conditions, surviving high winds and hail as well. Because James Hardie siding in Southgate Michigan is such a heavy and durable product, it will often cost more in installation due to needing more manpower and resources to put the siding on your home. It will be necessary to discuss this thoroughly with your contractor so that a plan is in place to properly install the James Hardie siding correctly using the right resources to get the job done right. The upkeep for James Hardie siding can be relatively easy, but there is the potential for chipping and the need to touch up. This can be alleviated if you opt for a protected finish, which will likely cover the costs of touching up the paint of the siding. Compared to other siding options, Hardie board siding can be on the higher end of the price scale. This is due to the heavy quality material. Depending on the source, Hardie board can cost $0.70 to $5.25 per square foot. This can really add up when working on a large project, but when comparing the pros to cons, the price could very well be worth it. Especially when you consider how your Southgate Michigan home will look once it is completed. There are several things you will need to take into consideration when choosing to go with Hardie board siding. The size of your project, the demand for your specific product (as well as availability), the climate your build is in, and the professionals you work with will all contribute to the results you get. Be sure to consult multiple contractors before committing to one specifically. This way you will ensure that you are getting what you pay for without paying more than you need to, but also getting a job well done. PreviousPrevious post:7 Benefits of James Hardie Siding in Southgate MichiganNextNext post:Is it Worth it to Replace Your Home’s Siding in Downriver Michigan?